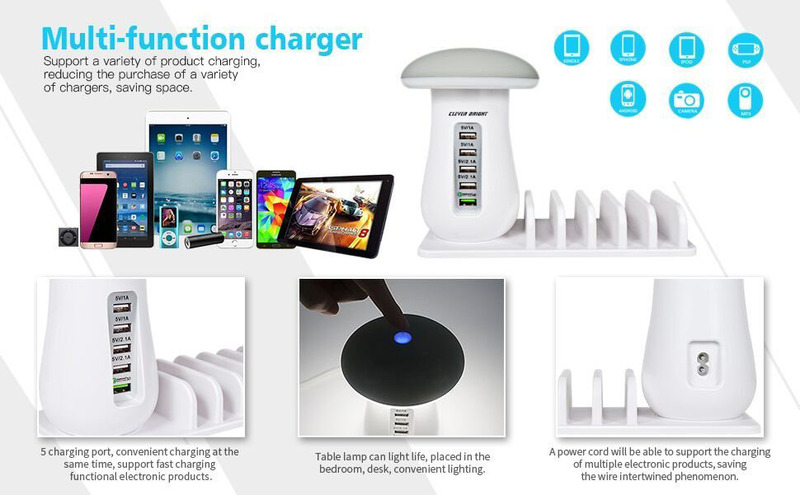 3 in1 Multi Fubction USB Charger Station Charging Organizer Power Strip, intelligent multiple protection: overcharge protection, over discharge protection, over power protection, over current protection, overvoltage protection, temperature protection and short circuit protection. 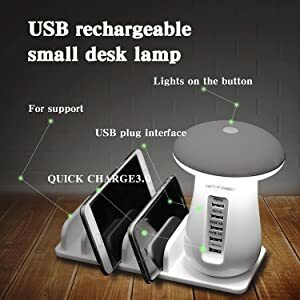 Mushroom lamp Charger for Android, Samsung ,Apple products and a variety of applicable parameters within the range of electronic products charged,it can be disassembled and used separately. 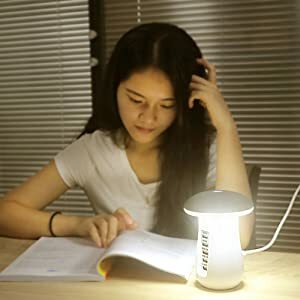 The desk lamp has a long life using, very energy-saving environmental protection, soft lighting will better protect your eyes, you can enjoy the soft atmosphere, no flicker and phantom comfortable reading/work/learning lighting. 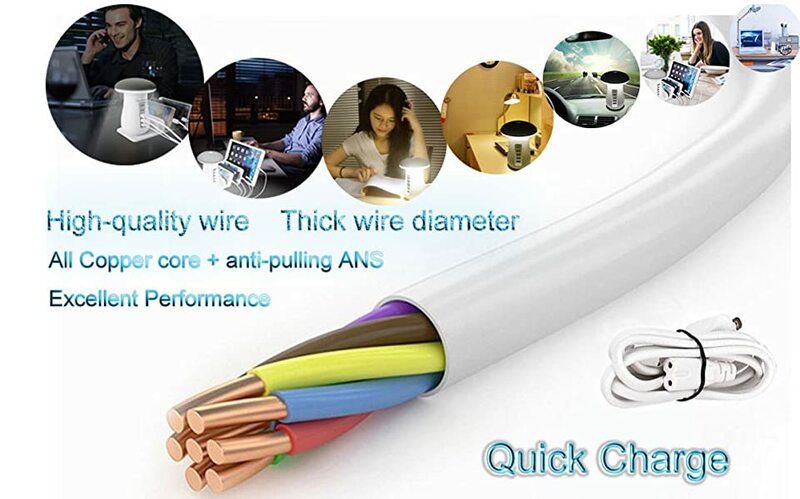 Table lamp has 1 QC 3.0 Fast Charger interfaces, 4 Smart USB ports, output 5V/2A (max) , 2 of which are: 5V/1A, 2 ports are 5V/2.1A, for Android, Apple products and a variety of electronic products charge. 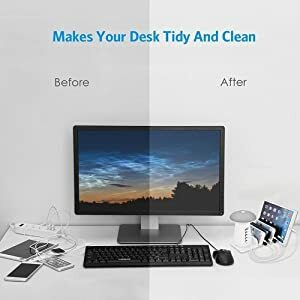 The charger stand can steadily hold all your devices at the same time, no more messy cords bother you anymore, giving you a tidy desktop, Saving you from additional charging adapter or power strip. Easy To Use and Space-Saving Design: Simply connect the 5-Port USB Charging Station to the power adapter and into a wall outlet. Mushroom lamp has four buckles at the bottom, you can stabilize the mushroom lamp does not slide on the base. Snap free, mushroom light can be used alone, easy and comfortable. ❶ Before use, check whether the charger and device parameters correspond to one. ❷ The power cord into AC100-240V. ❹ A single phone can be directly plugged into the cradle plug to charging, no need for USB charging cable. ❺ After the equipment is fully charged, please pull out the charger power cord. -The input voltage: AC100-240V 50 / 60HZ. -The output: DC 5V / 8A (5 USB, single port maximum support 3.1A).